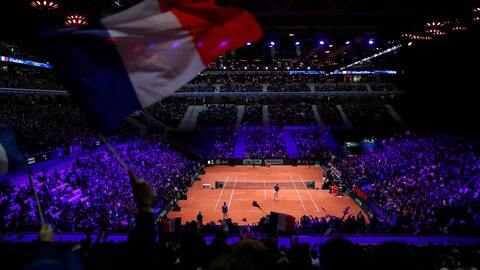 LILLE, France (AP) — Suddenly realizing he was listening to France’s national anthem for maybe the last time in his Davis Cup captain role, Yannick Noah could not hold back tears. Standing next to his players during “La Marseille,” Noah was emotional before Nicolas Mahut and Pierre-Hugues Herbert took on Croatia’s Ivan Dodig and Mate Pavic in the doubles of the final on Saturday. “It’s the first time it happens to me. I told myself it’s perhaps the last time I’m singing it,” said Noah, who will be replaced at the helm of the team by Amelie Mauresmo after this weekend. The former French Open winner will have another occasion to sing and cry on Sunday after Mahut and Herbert put a smile back on French faces with a 6-4, 6-4, 3-6, 7-6 (3) win to keep alive slim French hopes. France cut Croatia’s lead to 2-1. Croatia still remains favorite to claim one more point to dethrone the defending champions. Chasing an 11th title, France is back in the final but still faces a big challenge. The singles players were out of their depth on Friday, casting serious doubt on the chances of a comeback in Sunday’s reverse singles. Marin Cilic is set to face Jeremy Chardy, then Borna Coric plays Jo-Wilfried Tsonga if needed, although captains can change their lineups. No team has overturned a 2-0 deficit in a final since Australia beat the United States in 1939. On the indoor clay court at Pierre Mauroy Stadium in northern France, the script changed dramatically during a pulsating doubles match. Dodig and Pavic had only a few chances in the first two sets. Herbert played aggressively and Mahut raised his game on important points. The Croatian pair gradually found its rhythm and made the most of Herbert’s sudden dip on serve. They Croats moved into a 5-3 lead after a thunderous forehand pass from the left-handed Pavic silenced the home crowd, and the French paid the price for their mistakes at the net. Herbert struggled again on his serve as the French looked on the verge of a collapse at the start of the fourth, but he fought through a 13-minute game. Under pressure on his next service game, Herbert once again found the ability to get out of trouble as a lob from Dodig bounced just inches out. Trailing 0-40 on his serve with the French up 5-4 and facing jeers from French fans, Pavic showed more steel. He turned toward the French supporters and gestured as if to ask them to make more noise. He then launched consecutive service winners to fend off three match points and hold with a drop volley. But the French were more composed in the tiebreaker and earned three more match points after Dodig went long with a forehand, and Herbert produced a winning serve. Mahut converted the first match point with a fine reflex volley.